Happy New Year 2076 Everyone! We hope you have a great year ahead. One of the most exciting festivals that happen to be on the New Year’s week is Bisket Jatra in Bhaktapur. Every year, the whole city of Bhaktapur, Nepal, empties itself onto the streets for over a week to celebrate Bisket Jatra. It begins four days before the Nepali New Year and lasts for 9 days. It is one of the most exciting annual events of Kathmandu valley and is celebrated with most aplomb in Bhaktapur. Do you want to be a part of this excitement as well? Now is the right time to do so. The Bisket Jatra is happening now in Bhaktapur. But before you experience it yourself, here’s all you need to know about the grand festival: Bisket Jatra. There can be found two popular stories regarding the celebration of Bisket Jatra. The first one speaks of a king, a princess, her wedding and the death of her grooms. The next one talks of a Tantric power of the local people invasion suppression and the death of a snake. So basically, both of the stories are centralized towards the snake. Legends say that every time the princess got married, her grooms would be dead by the next morning. No one knew the reason behind the deaths. After a number of grooms lost their lives, one clever suitor decided to stay awake the entire honeymoon night. Soon after the princess fell asleep, he saw two giant serpents crawling out of her nostrils. When they were about to strike the young prince, he killed them using his sword. The next morning, the two serpents were publicly displayed on a pole. From that day onwards, people have been celebrating Bisket Jatra as the victory over serpents and end of evil. 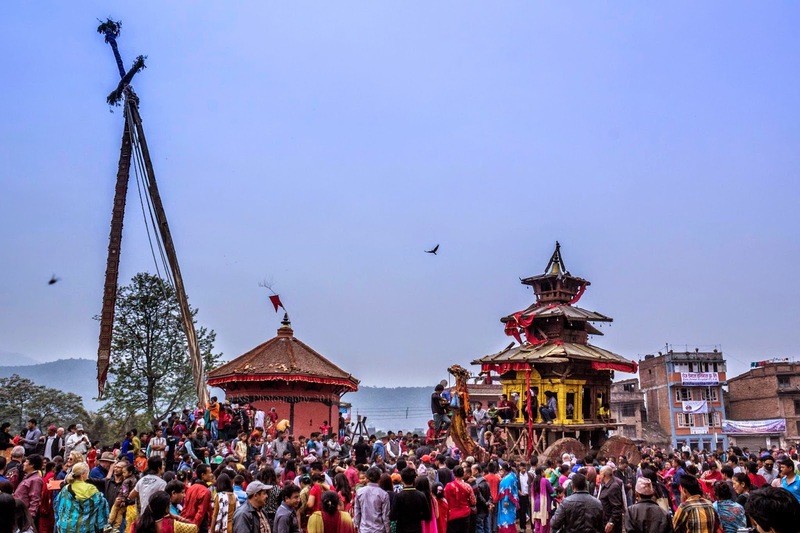 In the first two days of Bisket Jatra, the symbolic pole is erected in Taumadi Tole of Bhaktapur, displaying the serpents in the form of long ribbons. On the third day of the festival, images of Lord Bhairav and Goddess Bhadrakali are enshrined in two large chariots. The chariots are paraded through the streets of Bhaktapur. A massive tug of war between the east and west residents of the town creates a highly competitive atmosphere as the winning side is considered to be blessed with luck and good fortune for the year ahead. There are worships, rituals, and animal sacrifices to appease God. On the New Year’s Day, devotees take bath in the holy Hanumante River and pay homage to Yoshin, Lord Bhairav, and goddess Bhadrakali. They believe that taking a dip in the water of the river on New Year’s Day will keep them healthy throughout the year. The remaining four days of the festival after the New Year’s Day, families feast together with their relatives. The senior family members place Tika on the foreheads of the younger ones and relatives exchange blessing. Known to all, Bisket Jatra is an important occasion that brings families, friends, and relatives together. In Bode, a village in Bhaktapur District, the New Year celebrations are a little different; a tongue-piercing ritual is performed by one of the local farmers on the second day of the Nepalese New Year. 32-year old Juju Bhai Basha has been piercing his tongue since past 5 years and organizing a feast in the village at the end of the day to celebrate his success. Festivals in Nepal are often associated with deep-rooted religious faiths and traditions, but also have the benefit of bringing people together and inspiring them to celebrate together. Everyone can take part in this festival. If you also want to experience the excitement of this grand festival, make sure you visit the historic city now. The festival will last until April 18th. The parades are sure to bring a great dose of excitement and lasting memories, so why get left behind? Join the excitement now! ← Previous Previous post: PUBG Mobile Banned in Nepal??!! Next → Next post: TikTok Removed from Google Play Store in India. Will it be banned in Nepal too?